As a webmaster, you can block for CMS users edition of particular elements on a website. Regardless of CMS user's status, he won't be able to edit certain elements. How to block edition of any element on a website? 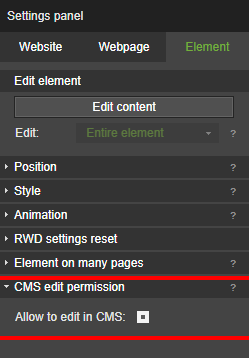 Select chosen element on a website and in Settings Panel enter "CMS edit permission" untick a box next to "Allow to edit in CMS". Done. The element is blocked and only webmaster is able to edit it.